Search by community from list of 32 Communities below: 28 in Scottsdale and 4 in Fountain Hills. When you decide to buy Scottsdale AZ Real Estate, be prepared to live amidst some of the most renowned luxury resorts and spas, championship golf courses, gorgeous homes, and natural desert beauty in the world. With all these amenities at your fingertips you’ll be living in paradise. 32 of Scottsdale's finest luxury communities. Many homes are golf course / home communities. The homes and real estate featured in these developments are the finest real estate in Scottsdale AZ. 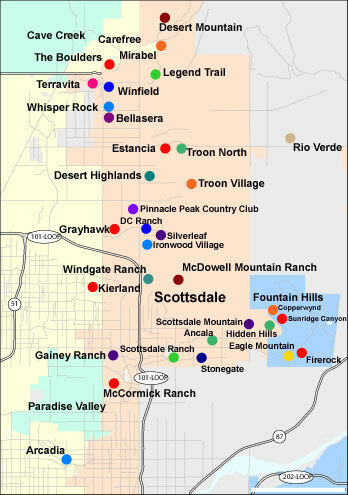 If you are looking for luxury homes / real estate in the Scottsdale AZ area, the communities featured here will have something for everbody (even the most discerning home buyer).